Here you can get Class 12 Important Questions Chemistry based on NCERT Text book for Class XII. Chemistry Class 12 Important Questions are very helpful to score high marks in board exams. Here we have covered Important Questions on Polymers for Class 12 Chemistry subject. Which of the following polymers of glucose is stored by animals? Which of the following is not a semisynthetic polymer? The commercial name of polyacrylonitrile is ______________. Which of the following polymer is biodegradable? In which of the following polymers ethylene glycol is one of the monomer units? Which of the following statements is not true about low density polythene? Which of the following polymer can be formed by using the following monomer unit? 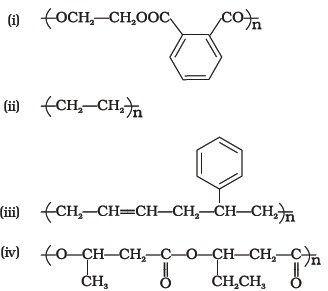 Which of the following polymers, need atleast one diene monomer for their preparation? Which of the folloiwng are characteristics of thermosetting polymers? (i) Heavily branched cross linked polymers. (ii) Linear slightly branched long chain molecules. (iii) Become infusible on moulding so cannot be reused. (iv) Soften on heating and harden on cooling, can be reused. Which of the following polymers are thermoplastic? Which of the following polymers are used as fibre? Which of the following are addition polymers? Which of the following polymers are condensation polymers? Which of the following monomers form biodegradable polymers? Which of the following are example of synthetic rubber? Which of the following polymers can have strong intermolecular forces? Which of the following polymers have vinylic monomer units? A natural linear polymer of 2-methyl-1, 3-butadiene becomes hard on treatment with sulphur between 373 to 415 K and —S—S— bonds are formed between chains. Write the structure of the product of this treatment? Identify the type of polymer. Out of chain growth polymerisation and step growth polymerisation, in which type will you place the following. 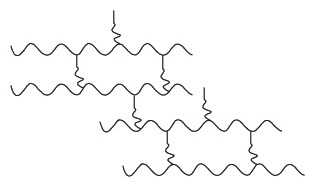 Identify the type of polymer given in the following figure. Why are rubbers called elastomers? Can enzyme be called a polymer? Can nucleic acids, proteins and starch be considered as step growth polymers? How is the following resin intermediate prepared and which polymer is formed by this monomer unit? To have practical applications why are cross links required in rubber? Why does cis-polyisoprene possess elastic property? What is the structural difference between HDP and LDP? How does the structure account for different behaviour and nature, hence the use of a polymer? What is the role of benzoyl peroxide in addition polymerisation of alkenes? Explain its mode of action with the help of an example. Which factor imparts crystalline nature to a polymer like nylon? Name the polymers used in laminated sheets and give the name of monomeric units involved in its formation. Which type of biomolecules have some structural similarity with synthetic polyamides? What is this similarity? Why should the monomers used in addition polymerisation through free radical pathway be very pure? Note : Match the items of Column I with the items in Column II. Match the polymer of column I with correct monomer of column II. Match the polymers given in Column I with their chemical names given in Column II. 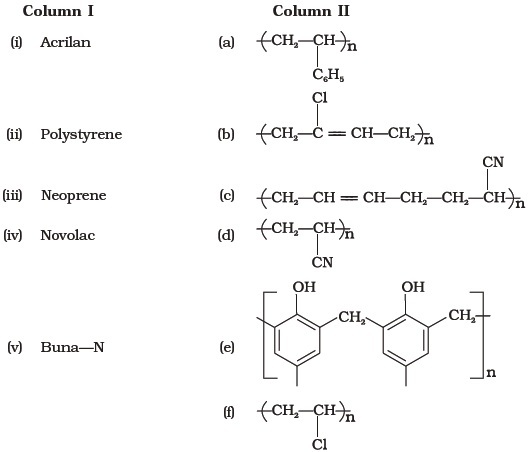 Match the polymers given in Column I with their commercial names given in Column II. Match the polymers given in Column I with their main applications given in Column II. Match the polymers given in Column I with the preferred mode of polymerisation followed by their monomers. Match the polymers given in Column I with the type of linkage present in them given in Column II. Match materials given in Column I with the polymers given in Column II. Match the polymers given in Column I with their repeating units given in Column II. (i) Assertion and reason both are correct statement but reason does not explain assertion. (ii) Assertion and reason both are correct statements and reason explains the assertion. (iii) Both assertion and reason are wrong statement. |(iv) Assertion is correct statement and reason is wrong statement. (v) Assertion is wrong statement and reason is correct statement. Assertion : Rayon is a semi synthetic polymer and is taken as a better choice than cotton fabric. Reason : Mechanical and aesthetic properties of cellulose can be improved by acetylation. Assertion : Most of the Synthetic polymers are not biodegradable. Reason : Polymerisation process induces toxic character in organic molecules. Assertion : Olefinic monomers undergo addition polymerisation. Reason : Polymerisation of vinylchloride is initiated by peroxides/persulphates. Assertion : Polyamides are best used as fibres because of high tensile strength. Reason : Strong intermolecular forces (like hydrogen bonding within polyamides) lead to close packing of chains and increase the crystalline character, hence, provide high tensile strength to polymers. Assertion : For making rubber synthetically, isoprene molecules are polymerised. Reason : Neoprene (a polymer of chloroprene) is a synthetic rubber. Assertion : Network polymers are thermosetting. Reason : Network polymers have high molecular mass. Assertion : Polytetrafluoroethene is used in making non-stick cookwares. Reason : Fluorine has highest electronegativity. Synthetic polymers do not degrade in the environment for a long time. How can biodegradable synthetic polymers be made. Differentiate between biopolymers and biodegradable polymers and give examples of each type. Differentiate between rubbers and plastics on the basis of intermolecular forces. Phenol and formaldehyde undergo condensation to give a polymar (A) which on heating with formaldehyde gives a thermosetting polymer (B). Name the polymers. Write the reactions involved in the formation of (A). What is the structural difference between two polymers? Low density polythene and high density polythene, both are polymers of ethene but there is marked difference in their properties. Explain. Which of the following polymers soften on heating and harden on cooling? What are the polymers with this property collectively called? 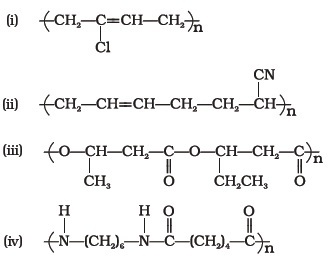 What are the structural similarities between such polymers? Bakelite, urea-formaldehyde resin, polythene, polyvinyls, polystyrene.